“‎Max was a truly unique musician. A remarkable composer who created music theatre works of searing power, great symphonies, intense chamber music, works of truly universal popularity. A fierce fighter for music in the community and in education, and on environmental issues. And a man of invincible integrity, a true friend and a teller of truth to power. He lived in the world, even though he seemed far away in Hoy or in Sanday, and he put his beliefs into action, whether it was to found a music festival for his fellow Orkadians which became an international success, bring music-making to a wider public through his time as Master of the Queen’s Music, or to march against the Iraq invasion. He loved life – and particularly the food and culture of Italy. The last years, even when battling against the leukaemia which came on him so suddenly, were an Indian Summer of wonderful, richly imagined works which brought him admiration from his fellow composers and warm responses from audiences. Sir Peter Maxwell Davies CH CBE, born 8 September 1934, died 14 March 2016. 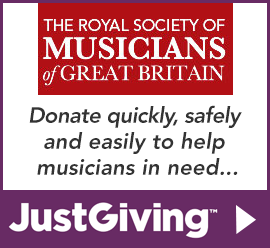 © The Royal Society of Musicians.